Stouffer’s vegetable lasagna recipe has saved many a household evening meal for busy people who are far too tired to cook. Just stop by your local department store, pick up a tray of frozen lasagna in your favorite flavor combination, slip it into the oven, and dinner is ready in about an hour – just about the amount of time it takes to get out of the day’s work clothes, shower off reminders of the outside world, and slip into something comfortable. But what if that local department store simply isn’t available? Or if family members have allergies or other dietary considerations? That frozen lasagna from the department store might not meet their requirements. But Stouffer vegetable lasagna ingredients are readily available in most stores, allowing you to make your own vegetable lasagna. 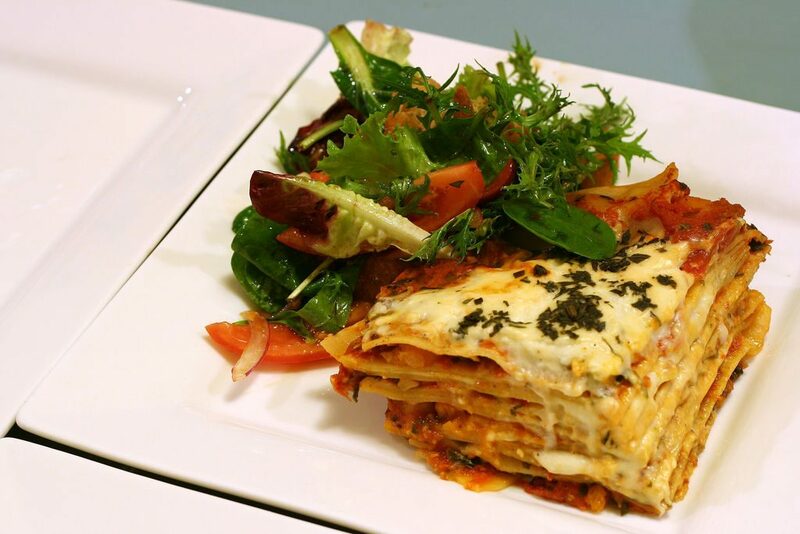 Better yet, by creating your own vegetable lasagna you can create a dish that caters to the dietary requirements or preferences of your household. 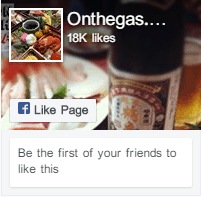 For example, most lasagna recipes include cheese. Cheese made using the traditional methods originating in Europe cannot be defined as vegetarian, let alone vegan. Why? Because cheese uses rennet, and rennet is usually derived from an enzyme found in the linings of the stomachs of cattle. Modern science, however, has found ways to synthesize rennet so that it need no longer come from the lining of a calf’s stomach. Some cheeses, however, are required to use the traditional ingredients. Since these follow the tradition of using all parts of an animal, not just the muscle meats most usually made into cuts that are suitable for your table, unless you are vegan or have other dietary requirements, need not be of any more consideration than that given the enjoyment of a good steak. For example, in order for a European cheese to be given the appellation Parmigiano-Reggiano. Fortunately, there are vegetarian versions of Parmesan, so even the strictest vegan can enjoy a bit of this grated cheese in lasagna or over spaghetti. This fortunate engineering of enzymes means that you can outdo Stouffer’s lasagna, especially for household members or guests who practice veganism. Better yet, modern cheese making has come up with “cheeses” that can be eaten by people who are lactose intolerant or even those allergic to milk. One small caution about those, however; many of them use nuts as their primary ingredients, especially almonds. So if the person is not only allergic to milk, but also allergic to tree nuts or legumes, use these cheese alternatives with caution. Cheese isn’t the only allergen that can be hidden in a pan of lasagna, even a Stouffer copycat recipe. The wide noodles used in the recipe are usually made from wheat. 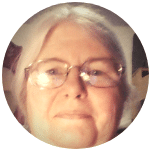 For people with Celiac’s Disease or just a sensitivity to wheat this can present a problem. 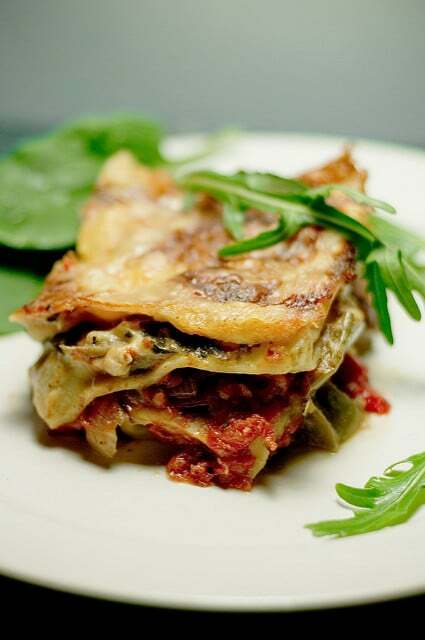 But you can easily get around this problem with your vegetarian lasagna by using your own home-made lasagna noodles. Because of their wide width, lasagna noodles are the easiest of all pasta types to make at home. 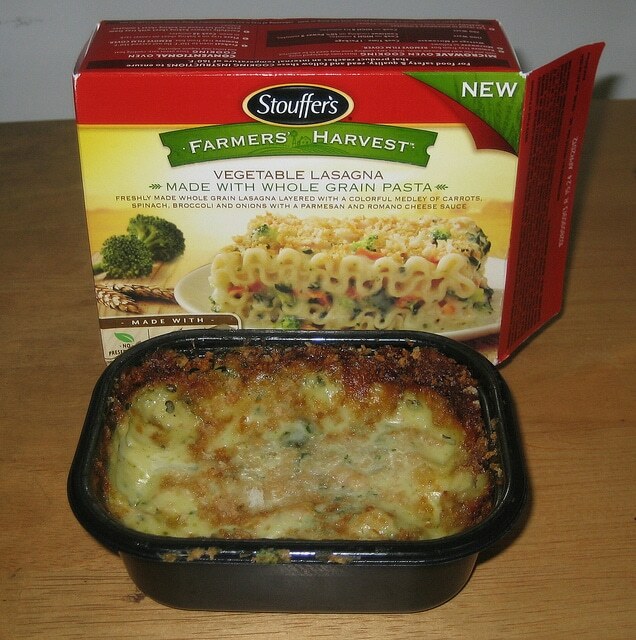 You can make Stouffer’s vegetable lasagna recipe your own just by making a few simple tweaks to the ingredients. Assess your needs or those of your family before you begin the recipe process. Do you love lasagna, but live alone? Divide the recipe by 4, and use the resultant reduced ingredients to make a small pasta dish that you can eat in one or two sittings instead of having pasta for breakfast, lunch and dinner for several days. Love lasagna, but are feeding a small army? Ease off on the ricotta, and go with cottage cheese or similarly inexpensive ingredients and multiply the preparation according to numbers to be served. If cost is no object, simply double, quadruple or whatever the original recipe. Or make more than one batch. Lactose intolerant or milk allergies? Try vegan cheeses, which are primarily made from tree nuts. If you cannot tolerate nuts, either, try making a lasagna that doesn’t contain cheese at all. Wheat allergies or sensitivity or just trying to live a little easier on the earth? 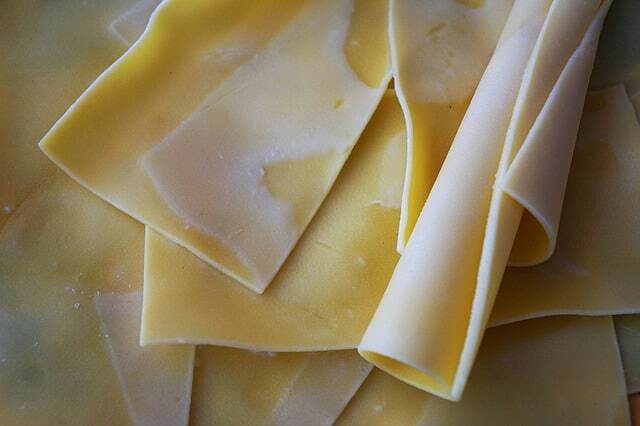 Make your own lasagna noodles using an alternative flour. You can make it with or without eggs. Have a problem with tomatoes or other nightshade family members? This one is a little harder, especially if you are dealing with other allergy problems. But lasagna is a layered noodle dish, so you can layer with foods that your system can handle. Gravy without wheat? Oh, you bet. Nothing simpler, just use cornstarch or rice flour. Ragu sauce is used in most lasagnas. This fine particle sauce is made from tomatoes, chopped vegetables, herbs and spices, sometimes with meat or another protein additive, such as tofu or chopped nuts. Although layering the lasagna begins with the noodles, the sauce is probably the first thing you will need to make. Alternatives to ragu sauce include alfredo white sauce or even a brown gravy sauce. 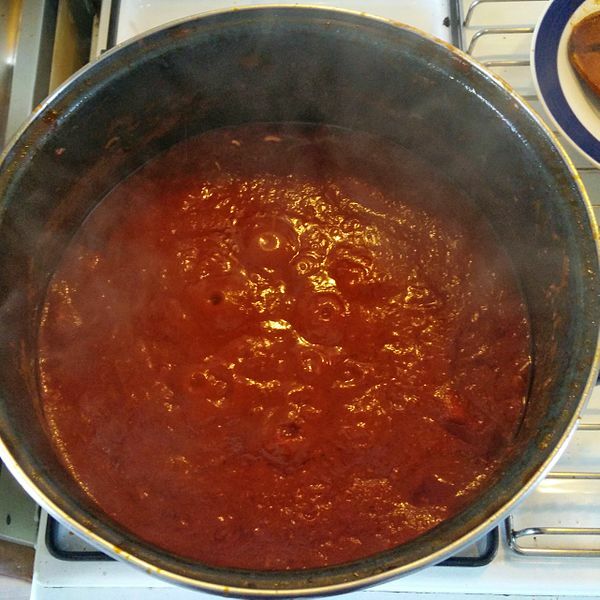 Ragu Sauce – peel 10 to 15 pounds of tomatoes. Roma tomatoes are best, but you can use any combination of fleshy tomatoes including Big Boys or other hamburger tomatoes. Yellow tomatoes make a super low-acid sauce that has a uniquely delicate flavor. Yellow tomato sauce must be pressure canned or frozen if you are preserving part of the sauce because they are too low in acid to be safe as a water bath preparation. Add grated carrots, chopped celery, onions and garlic to the peeled, chopped tomatoes. Add the spices that you and your family particularly like or you can use one of the Italian spice mixes that are commercially available. Start the sauce early or even the day before as part of the secret of making a good ragu is long simmering and frequent tasting to make sure that the spice component is just right. Alfredo Sauce – heat 2 tablespoons of butter and one cup of heavy cream in a sauce pan or high sided frying pan, but do not let it boil. Sprinkle in ¼ cup of grated parmesan cheese until it is well melted. Serve or use immediately. Plain white sauce – for those who want a white sauce, but are not tolerating milk very well, you can thicken almond or soy milk using corn starch. Whisk two tablespoons of corn starch into one cup of liquid. Heat until it bubbles lightly, then remove from heat while still stirring and let stand to continue to thicken. Note: this might not be as thick as when made with cow’s milk. Brown or Golden Sauce – Whisk two tablespoons of cornstarch or flour into beef or chicken broth. Heat in a heavy saucepan until it bubbles and then begins to thicken. Remove from heat, still stirring, then allow to continue thickening for about 15 minutes. Serve warm or use immediately. The Noodles: Lasagna noodles are wide, flat planks of pasta. They can be made from wheat, rice flour, or other alternative flours such as spelt, barley, or oats. These flours (singly or in combination, according to your taste and the needs of your family) can be mixed with egg to make egg noodles or simply mixed with water. A pinch of salt is usually a good idea, but if you have someone in the family who is limiting use of salt, it isn’t absolutely essential. In terms of measurement, ¼ cup of water is approximately equal to 1 egg. To make a good batch of lasagna noodles, you want to work as much flour as you can into three eggs or ¾ cups of water, depending upon desired texture and whether anyone in your family has a problem with eggs. Roll the stiff dough out on a floured board and cut it into wide rectangles. You can dry the noodles to use later (freeze egg noodles) or you can use them right away. Cheese: Three cheeses often used in making lasagna include ricotta, cottage cheese and mozzarella. This combination creates a lovely meld of crumbling and stretching with a flavor that just can’t be beat. But you are certainly not limited to this combination. Parmesan is often used to sprinkle on top of the final layer to help create a flavorful crust. With that said, you can combine or try any of the cheese or cheese alternatives previously mentioned. You can even make lasagna without cheese if it is likely to cause problems. Protein layers: Ground beef or pork are often layered into lasagna. The sauce, cheese and noodles can help stretch modest amounts of meat to feed a large group. 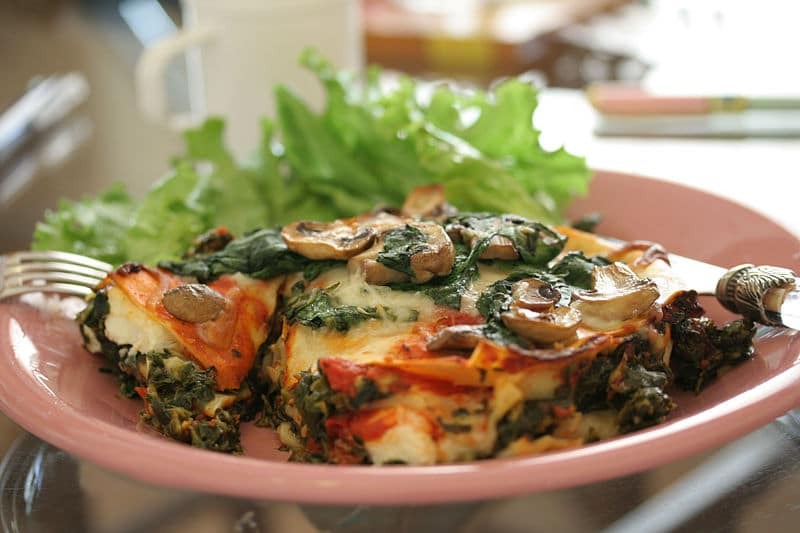 If you are preparing vegetable lasagna, you can simple skip this part or you can use meat substitutes such as TVP or tofu. In some cases, especially for a white lasagna, you can use crumbled hard-boiled egg instead of meat. Garnish: You can create a top crust using crumbled crackers and parmesan that can be browned in the last stages of cooking. Green onion or chives can be sprinkled over the top of the cooked, slightly cooled dish. Parsley also works great as a garnish, and individual servings can be nested on a bed of curly kale leaves. If making a ragu, simmer the sauce earlier in the day or the day before. Other sauces should be prepared after making the noodles so that they are fresh. Bring a large pot of water to a boil, add salt and either 2 pats of butter or two tablespoons of olive oil to the water. Next, add the noodles and cook until they are al dente. Oil the bottom of a large glass baking dish with olive or grapeseed oil. Place a layer of noodles on the bottom of the pan. 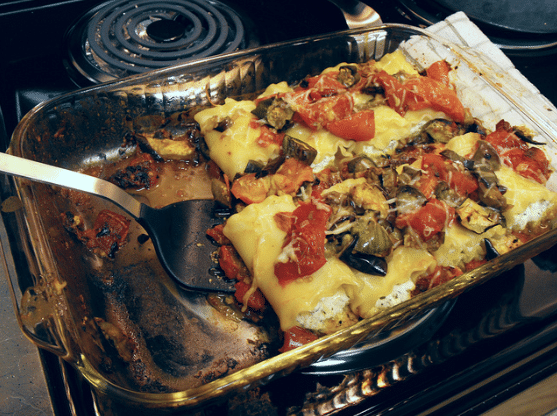 Add a thin layer of sauce, followed by a layer of each of the types of cheese being used and sprinkles of the protein. Add another layer of noodles and repeat until the dish is completely filled. Place in an oven heated to around 350 degrees Fahrenheit, until the cheese is melted and the ingredients are starting to cook together. During the last few minutes of cooking, add a mixture of cracker crumbs and parmesan on top of the cooking lasagna layers, and allow it to brown. Remove the dish from the oven, and scatter chopped chives or chopped green onion on top of the crust. Strategically place fresh parsley on top. Line the serving plates with leaves of kale. Allow the lasagna to stand for at least five minutes after it comes out of the oven. This will let the cheese begin to solidify a little so that pieces can be cut from the lasagna and delivered intact to the serving plates. One of the beautiful things about a Stouffer’s Vegetable Lasagna Recipe or even a copycat is that there are so many ways that you can make it your own. You can tone down the calories, substitute ingredients to meet the needs of people with allergies, beef up the nutrition, or stretch limited resources to feed a lot of people. Because it is essentially a casserole dish that depends on layering, it is so easy to make any needed changes without losing the essential flavorful nature of the dish. So whether you love red lasagna or white, or even want to be a complete rebel and use a brown sauce, there is a way to create a lasagna that is delicious and will get raves at your next dinner party – even if that is a late-night party of one after a hard day at work. Lasagna is the ultimate make-ahead dish so you can keep assembled lasagna tucked in your freezer, ready to pop into the oven or microwave. So when you are making lasagna, you don’t need to worry too much about reducing the recipe – just make a few dishes ahead.